Sold either by the unit or in fun groups of bees, use them to personalize your clothes or accessories with ease. They stick with the heat of the iron, and some can also be self-adhesive (read the description of each product for more information). By units or in packages with lots of bees, these buttons will help you decorate numerous patchwork and general sewing projects. Original ribbons with bees motifs, to complete projects for the kitchen or for the garden. Any other products with a bee decoration or print can also be found in this section. Product description: Decorative button with the shape of a bee hive in yellow color with black details. Suitable for plenty of different types of creative sewing and other craft projects, such as scrapbooking or card making. Contents: 1 button Dimensions: the button has a diameter of approximately 22 mm. Material: Plastic. Product description: Decorative button with the shape of a honey bee in traditional yellow and black, with white wings. Suitable for plenty of different types of creative sewing and other craft projects, such as scrapbooking or card making. Contents: 1 button Dimensions: the button has a diameter of approximately 22 mm. Material: Plastic. Product Description: Decorative buttons with the shape of a bee. Ref. Dress-It-Up: 0735. To be used in needlework, craft, scrapbooking, patchwork and card making projects.Content: 8 buttons of the same model.Diameter: 18 mm.Material: Plastic. Product Description: Decorative buttons with the shape of a bee. Ref. Dress-It-Up: 1858. To be used in needlework, craft, scrapbooking, patchwork and card making projects.Content: 20 buttons.Diameter: approx. 11 mm.Material: Plastic. 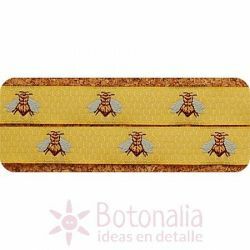 Product Description: Stickers (patches) with an embroidery of a bee.Content: 3 different iron-on stickers.Maximum Length: 38 mm.Material: Textile.NOTA: This product can be used as self-adhesive or iron-on sticker. That is to say that the product has been designed to be fixed with the heat of the iron but it will also stick without heat. Product Description: Iron-on stickers (patches) with an embroidery of a bee smiling.Content: 2 iron-on stickers.Dimensions: 20 x 27 mm. Max. length: 37 mm.Material: textile. Decorative buttons with shapes of insects, flowers and flower pots. Dress-it-Up Reference 1226. Perfect for patchwork, scrapbooking, card making and other craft projects. Content: 14 buttons of 4 models (flowers, flower pots, ladybugs and bees) in various colors. Diameter: 16 to 26 mm. Material: Plastic. Product Description: Decorative button with the shape of a bee.Content: The price shown is per unit.Dimensions: 16 x 16 mm.Material: Plastic. 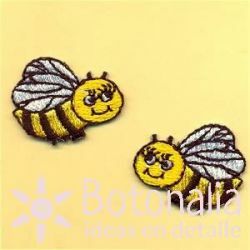 Product Description: Sticker (patch) with an embroidery of a bee in many colors.Dimensions: approx. 40 x 50 mmContent: 1 iron-on stickers.Material: Textile.